iMovR’s first entry into the standing desk converter category literally rises above sitting disease. The Cadence Pro workstation’s space-preserving “hover” design retains virtually all of your desktop real estate and maximizes mobility and collaboration. It also brings more ergonomic adjustments to the table than any other standing desk converter we’ve ever reviewed—with the ability to move throughout an astounding 105”-diameter area—providing a more comfortable and productive experience for all users, sitting or standing. With all of its ergonomic improvements and elegant styling, the Cadence Pro gives the venerable, but aging progenitor of hovering sit stand workstations—the Ergotron Workfit-A—a run for its money. Standard Shipping of $79 in continental US. Additional charges for AK, HI, Canada. DHL available for international. Base Dimension: 5.5" x 8"
Top Work Surface: 9" x 28"
Keyboard Tray: 9" x 28"
The Cadence Pro's "Hovering" Design preserves desk space and allows users to easily move their workstation around a large, 3D space. Its 25.5" height adjustment range is the highest of any standing desk converter, and meets ANSI/BIFMA standards for height-adjustable desks. Additionally, it features a height-adjustable, angle-adjustable keyboard tray for optimal comfort and ergonomics while you work. 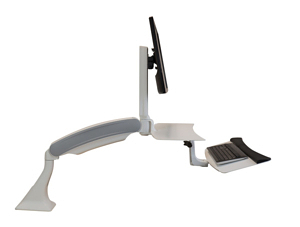 Hovering sit-stand converters are great for keeping your desktop workspace intact, but lack sufficient stability to use with treadmills under foot. The Cadence Pro workstation raises the bar for ergonomic standing desk converters everywhere, both in functionality and style. Its unprecedented height adjustment range comes closer than any other standing desk converter we’ve tested to duplicating the coveted ANSI/BIFMA-standard range of actual height-adjustable standing desks. To preserve your desk top space, the Cadence Pro “hovers” over your desk, rather than on top like nearly all other workstations do. This allows you to keep virtually all of your desktop real estate as accessible as ever, and allows you to swing your keyboard and monitor (or dual monitors) completely out of the way, or anywhere you want to share the screen with collaborators. The Cadence Pro is a perfect solution for some, but not all users—it’s inherently less stable than desk-topping options like the Helium and Kangaroo workstations—but its unique design more than makes up for its shortcomings, and is ideal for collaborative, and paper flow-intensive workspaces. Note: This is one of three models in iMovR Cadence Desk Converter line. For reviews of the other models, see iMovR Cadence Express Review and iMovR Cadence Plus Review. Standing desk converters have seen great advancements in the relatively short amount of time they’ve been on the market. Just about every day, new kinds of workstations are emerging, making it easy for users to choose the right one for their needs. 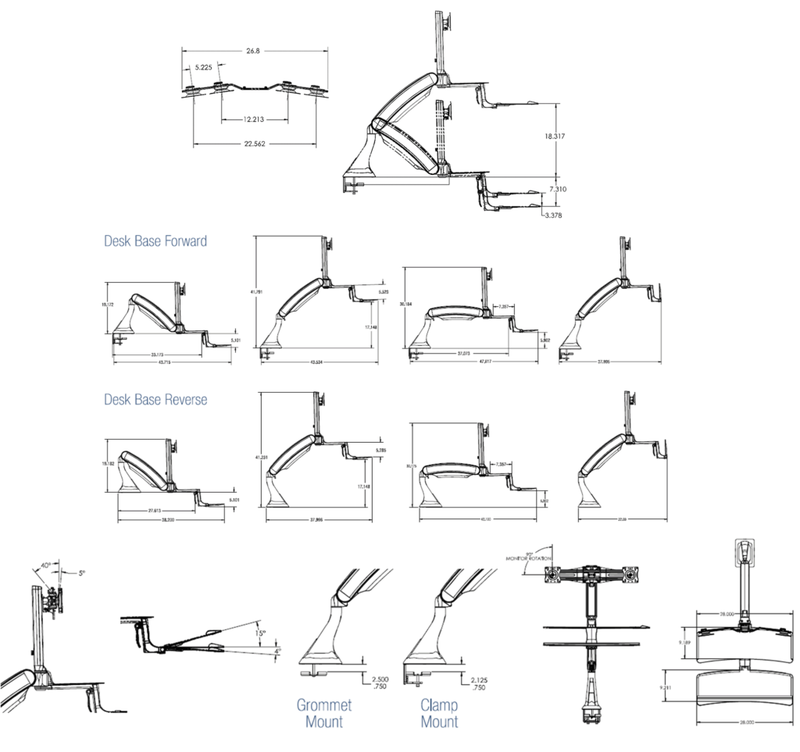 One segment of the standing desk converter category that’s been seeing these advancements is what we like to call “hovering” workstations, so named for their unique design, which places the work surfaces and monitor mount on an articulating arm segment similar to a giant monitor arm. Unlike more typical standing desk converters, which take up the entire center of your desk top, these “hovering” workstations—like Ergotron’s Workfit-A and ESI’s Climb—preserve your desktop real estate and can easily be moved around a large three-dimensional space with just a light push. The Cadence Pro is the very latest iteration of this “hovering”-style standing desk converter, solving some ergonomic shortcomings of its predecessors and introducing a fresh and elegant styling in its design. It is the first standing desk converter to be produced by iMovR, who are known for their wide selection of ergonomic adjustable-height desks and tables, high-tech treadmill desks, and ergonomic accessories. The Cadence Pro is a sit stand workstation built in the classic iMovR fashion, with a keen eye towards ease, ergonomics, and style. Right out of the box, we were impressed with the Cadence Pro's high-quality manufacturing standards. Its components are all dense and sturdy, particularly its heavy aluminum base. The Cadence Pro arrived at our test lab in excellent shape, securely packaged in layers of foam and cardboard—we didn’t notice any obvious signs of damage to any of the components from transit. Assembly is a straightforward process, especially if you view the Cadence Installation Video first (highly recommended). The first step is to install the base, either clamped onto the back edge of the desktop or mounted through a grommet hole—components are included for both methods of installation. A clever nuance, the base has an angled profile, allowing you to install it in either a forward or reverse position, to better fit either a 30” or 24” desktop depth. Once the base is secured to your desk, simply attach the articulating arm segment, the work surfaces, and the monitor post. The Cadence Pro features a strong 5 year warranty, but given its heft and quality of construction one imagines a much longer life expectancy from this product. This is something we can’t say about the ever-popular, but cheaply made Varidesk workstations, whose skimpy one year warranties aren’t much of an issue because so many users upgrade to something better in less time than that. The Cadence Pro has a more handsome aesthetic than many other standing desk converters—especially the Workfit-A, whose chrome components easily collects dust and fingerprints, and whose plastic extrusions look cheap compared to the Cadence Pro's seamless appearance. 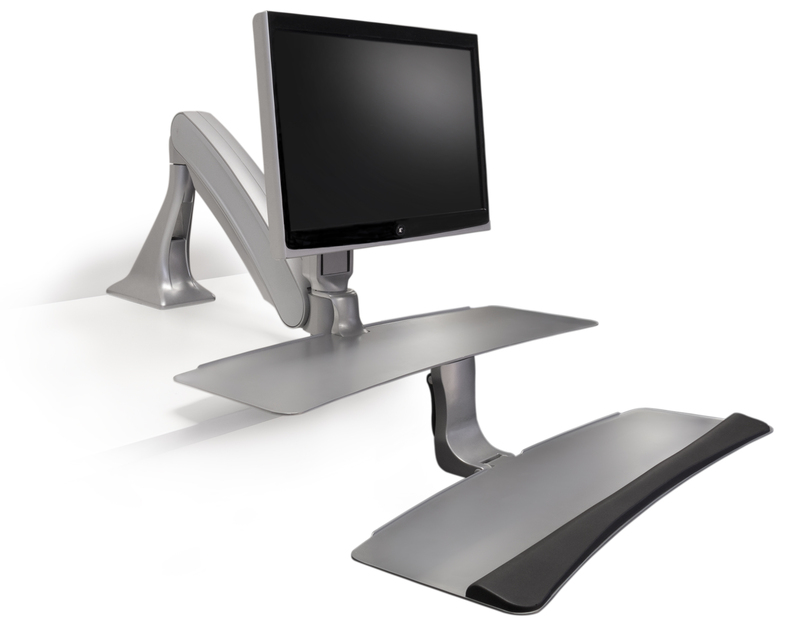 Many of the most popular desk converter models on the market—the Kangaroo or the ErgoTech OneTouch, for example—feature aesthetics that can only be described as ‘industrial’. The Cadence Pro on the other hand looks svelte and elegant—it’s available in black, white, or silver—trendy colors fit for any office environment. The Cadence Pro looks and functions much like a supersized monitor arm. Its aluminum base is the only component that makes contact with your desk, and has a minimal footprint of just 5.5” x 8”. The rest of the workstation is positioned on the end of its articulating arm, which has an impressively broad range of horizontal and vertical motion. A monitor mounting post accommodates any VESA-compatible monitor(s) with 75 mm X 75 mm or 100 mm x 100 mm hole patterns, while an optional bar lets you mount two. (If using the dual monitor bar note that the bar itself weighs 4 lbs, and each monitor should weigh 8 lbs or less to stay under the recommended 20 lb limit for the monitors.) Once attached, your monitor can be independently adjusted in height, and can rotate, tilt, and pan. You don’t often find all these adjustments on a sit-stand converter, and certainly not this easy to use. Even some of the most expensive sit-stand converters come up short when it comes to monitor adjustments—often requiring tools or awkward to adjust without getting behind the desk. The Cadence Pro is comparably more adjustable—and more easily adjustable—than these, and at a lower cost. Like the Workfit-A’s “suspended keyboard” model, the Cadence Pro features two work surfaces, each measuring about 9” x 28”: a main work surface, and a dropped keyboard tray a few inches underneath. This suspended keyboard tray mimics under-desk keyboard trays, and can also be vertically adjusted independent of the rest of the workstation to give users yet another layer of control over how they work. Hovering workstations like Cadence Pro preserve your desk top space. So what is the point of a “hovering” standing desk converter? Space, for one. Conventional desktop converters take up a substantial amount of your desk space. This may be a minimal inconvenience for some users who treat their sit stand workstation as if it were a complete desk replacement—they may only need enough space for their keyboard and mouse, and maybe a few documents. But users with a lot of work material and greater space needs will want a device that still lets them keep their workspace intact. 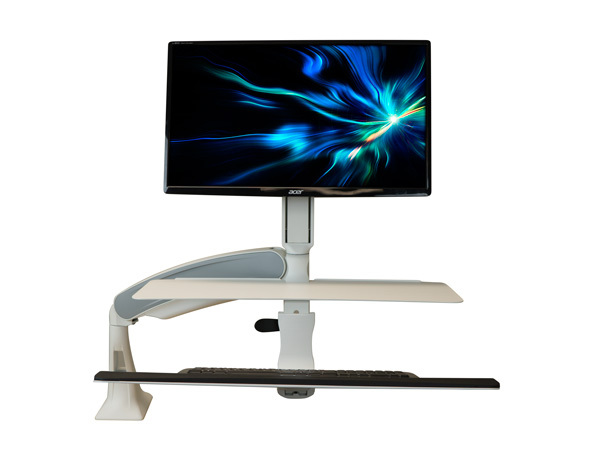 Because the Cadence Pro “hovers” above your desk rather than sitting on top of it, you have the benefit of a sit stand workstation, in addition to keeping virtually all of your desk space. Another benefit to this “hovering” style of standing desk converter is that it’s incredibly mobile. Conventional workstations—something along the lines of the Ergotron Workfit-S or the Humanscale QuickStand—clamp onto your desk, affixed in place. Freestanding workstations like the Kangaroo or the Helium are a step in the right direction—they sit atop heavy bases that slide along your desk top to wherever you need. But even these require plenty of clear, uninterrupted table space to move around. Hovering-type workstations literally rise above all the clutter, allowing you to swing your work surface from one side of its considerable horizontal and vertical range to another without interrupting your workflow. Its range of motion draws a giant hemisphere of 105” in diameter and about 45” in height (depending on the size of your monitor). Where Cadence Pro really shines is in its ergonomic adjustability. Its keyboard tray has a max height of 18” (22” for the main work surface), but can also reach 7.5 inches below your desk top, allowing users to type in a more ergonomic position when they’re seated. This incredible height adjustment range—25.5 inches total—surpasses the other standing desk converters on the market, giving Cadence Pro the edge in ergonomic customization. In fact, Cadence Pro is the first sit stand workstation to provide the same height adjustment range as an ergonomic stand up desk. When used with an office-standard 28”-tall desk, the keyboard tray can reach anywhere from 21.5”- to 46”-high, meeting the ANSI/BIFMA and HFES standard for ergonomic workstations. This makes the Cadence Pro a true sit to stand workstation, able to accommodate sitting and standing work from the 5th percentile of seated female users to the 95th percentile standing male users according to the US Census. Further enhancing the Cadence Pro's ergonomic capabilities is its keyboard tray’s angle adjustability. Typing on a flat surface is taxing on your wrists and arms over time. For a more natural, comfortable experience, we recommend setting your typing surface to a negative angle. This keeps your wrists straight and your arms in a relaxed position, for hours of typing comfort. Unfortunately, most standing desk converters don’t have adjustable keyboard trays (AKTs) built in, offering just a horizontal shelf for your keyboard and mouse. Ironic, since most of them either also sell AKTs or have “Ergo” in their brand names. And those that do incorporate AKTs don’t adjust gradually, but in just two specific angles. The Cadence Pro, meanwhile, allows you to type at any angle from +4° to -15° degrees, saving your wrists from pain and stiffness throughout the day. Like on the WorkFit-A, the entire keyboard work surface can also be flipped up to a vertical stowage position to make even more space available at your desk. We have yet to find this many ergonomic adjustments on one sit-stand converter, even at twice the price. When we first saw the Cadence Pro, we fully expected a shaky, unstable workstation. After all, most workstations exhibit some level of instability, and the Cadence Pro is built in the same manner as a monitor arm, which typically acts as a giant moment lever susceptible to shaking and vibration during use. But after spending a couple of months working on the Cadence Pro, we have been duly impressed with just how stable it turns out to be. Our expert review team has tested just about every desktop riser on the market, yet they were hard-pressed to notice much shakiness in the Cadence Pro—even compared with other, conventional workstations like the Workfit-S or the QuickStand. Much of this stability can be attributed to its heavy components and robust mechanical lift mechanism—which gives the Cadence Pro a capable 25lb. lift capacity. It doesn’t quite have the rock-solid stiffness of the Kangaroo or the Helium. But the Cadence Pro is nevertheless stable enough for regular use, all while using up less space than either of the two. The Cadence Pro pushes the envelope for sit stand converter ergonomics, and styling. Its unprecedented height adjustment range is greater than that of other sit-stand converters, and its adjustable keyboard tray angle guarantees a comfortable, ergonomic typing angle. Its “hovering” design preserves your most valuable desktop real estate, allowing you to maintain all of your work and equipment while still enjoying the benefits of a sit stand workstation. At only $399—including free shipping—it packs more adjustability and range of motion than any other product we’ve tested in this category, and outshines its competitors in this price range with its elegant aesthetic.